At the weekend I was on a hen party with a woman who casually confessed that she could never be arsed to cleanse her face, so never did. Rather went to bed covered in make up. It was up til then quite a jovial affair so there was little I could do but give her the thousand mile stare, head bobbing up and down like one of those nodding dogs in a four by four on rough terrain, and keep my horror to myself. Nobody wants their wedding memories to include ‘That time Rebecca went feral at the hen do and barked at that nice mum of two’. 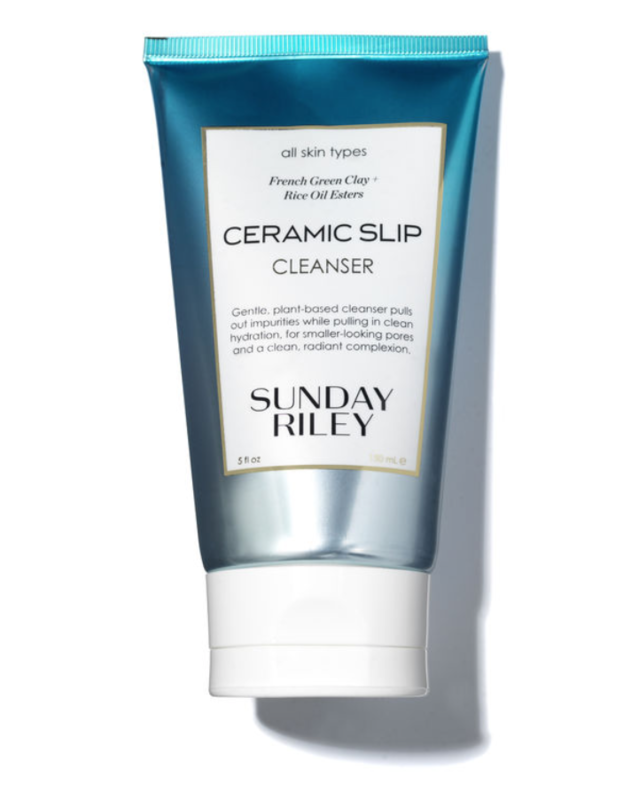 The name of the Sunday Riley Ceramic Slip cleanser did something to me, in the way that when an expensive brand puts two random things that sound quite nice next to each other it sounds luxurious. ‘Ceramic’, like my face will become a creamy white side plate that you could butter your roll on. ‘Slip’, like what would happen if you tried to run across my face, it’d be so clean and shiny like a hospital corridor. First impressions were that it is the exact texture and consistency of condensed milk, which is my favourite food of all time. So far so good. It says it contains French Clay, like a posh bit of French pottery. I apply, enjoying the creaminess and considering my soon to be ceramic dinner plate face. It’s lovely and goopy but slightly……sting-y? Around the eye area. ‘It’ll be fine’ I tell myself every day as I persist. ‘Eventually your body will get used to it and built up a resistance’. But like……why would I want that to happen? When I can just use one of the many gentler products on offer? Hard to tell whether it’s the bleak midwinter, with its icy winds and moisture draining properties, or the cleanser itself, but for whatever reason this has caused some pretty irritating dryness around the under eye and neck area. Hardly ideal. Bits of me are certainly ceramic-y but the rim of the dinner plate has that slightly cracked and weathered effect that on the antiques roadshow they would say lessened the value. Sadly would not buy again. Shame.